Shane meant it. He meant it both literally and figuratively. And after listening to him for an hour and a half, I believed him. Quiet spoken, presentable and clean, Shane tells stories matter-of-factly about three years of prison at 17, fleeing San Diego’s drive by shootings for his sister’s place in Nevada, pedaling to stay alive at 20 degrees in Boise living on the trike, attempts on his life, episodes with the law, an ex-wife, estranged child, and child support. These stories come flowing out unbidden on the way to stories that did answer my questions. Shane apologizes for rambling but I tell him that it makes my job easier. And I just listen thinking that, at 36, Shane has lived a good deal more than I ever will. Don’t think I’d want to trade, but I’m impressed at his equanimity. There’s never a poor me, a complaint. These are just the raw facts of his life. They are what they are. And they include how the trike came to be his and they include the “transformation.” But at the center of them all lives the trike. It is about four feet wide made of steel bicycle tubes. When he found it in a Boise pawn shop, it was new. He speculates that it had been built as a racing cart and hadn’t worked out. It had a hammock seat and 20 inch wheels. Hardly the piece of equipment we see today complete with a fan to cool the driver, battery fed lights, a car audio deck mounted under the seat for easy access, a Toyota pickup seat which adjusts to accommodate his wife’s shorter legs, a solar panel, an air-compressor (for filling flats), an AC inverter so he can run his motor home off the battery, and a generator to charge that battery. And today the latest in trailer technology built of steel by Pacific Steel who “mashed” his previous trailer with a fork lift removing a refrigerator he’d hauled in. He was delivering pizza for Pizza Hut in Boise with his Subaru. He had a second job too working with cultured marble. He was doing well and had insurance when a co-worker who hadn’t covered all the bases backed into the Subaru doing heavy damage for which his insurance for some reason wouldn’t pay. These things seem to happen to some guys. This was the source of his troubles. He lost the Pizza Hut job presumably because he no longer had a vehicle. I don’t know why he lost the second job. It wasn’t clear or wasn’t brought up. Somehow Shane ended up living in McCall. Perhaps he thought to work as a logger. The Subaru was running again now and he had friends to help him there. He didn’t build the trike. He says. It evolves. He’s good with mechanical things and that seems fortunate as his stories tell of the left front wheel bounding off into the air and over a bank and of chains breaking, and of tires wearing thin under the weight. The weght? 250 lbs plus another 100 for the trailer and that’s before you add a payload. Somehow the Subaru breaks down on the side of the road near McCall. And this sends him back to Boise. He wants that trike at the pawn shop. With his last paycheck he buys the trike for $400. 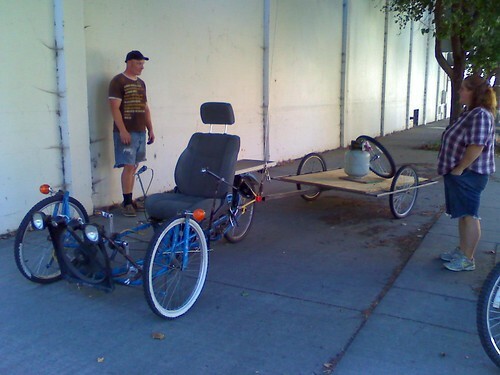 The trike has a way to go in its evolution to whatever it is going to become. Brakes for example. He’s tried a number of systems and now has only a conventional brake pads for the back. “If I really want to stop, I put my feet up on the front wheels and brace them against the mounts.” He demonstrates. “Smoke blows off my shoes when I do that,” he adds. And chains? “I get old bikes and scavenge parts” including the chains which he links and re-links when they break. And they do often and anywhere. Those chains were never meant to handle the stress he generates on the pedals. Could he upgrade to heavy duty chains and, say, a disc brake in back? No. It would mean rebuilding the drive train and the hub. He doesn’t even seem interested in the possibility. 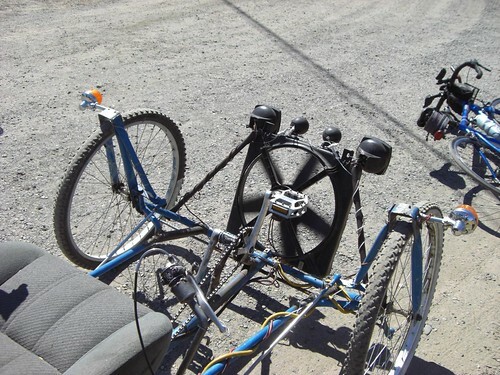 It is hard to know if the trike is a wonder of innovation or just a collection of ill-matched parts likely to give out at any time. But, to Shane, whose stories seem to include a good deal of being left by the side of the road, it is far more. He is loyal to the trike. “I’d have never left that,” he says pointing to where the trike and trailer piled high with bicycle parts waits in the sun. A Clarkston officer seemed to think the trike needed a license and even got Shane to leave it in the driveway of a friend. (He never seems short of friends or a car or help though sometimes it comes a bit slowly.) Next day he finished his load to Pacific Steel and visited the Sherriff’s office about a week later. His non-chalance about the law seemed founded on something stronger than the Sherrif’s saying it looked fine. But he blew off the request to have it inspected by motor-vehicles and says he hasn’t had further trouble with the police. The woman is good as her word taking him to a fellow who indeed had bike parts and tools and allowed Shane to use them. Over a three day period Shane rebuilds the trike. It now has 26 inch wheels rather than 20 inch which greatly improves its clearance on the road. But the fellow has a tenant on meth who believes Shane is an undercover cop and tries to kill Shane. These things happen to some guys, don’t they? The trike is everything to Shane and Crystal. I’ve used it to carry water, food, clean clothing; to get cigarettes, to haul scrap metal and parts, and garbage. I’ve moved with it, made a living from it. Used it as a hot-dog vending stand (he offers to show me his vendor’s license), jump started other vehicles with it, aired up other folks’ tires, powered our house, provided rides to friends, pulled people on sleds in the winter, hauled mattresses, couches, and firewood. His ex-wife and daughter living in Clarkston encouraged him to join them. He moved into a rehab apartment with a young man on parole. The young man had a sister, Crystal, whom he wanted Shane to meet. They talked on the phone but met only when too many parole violations sent the brother back to prison. Shane packed up the brother’s stuff and hauled it, yes, with the trike, over to Crystal. “Most dangerous thing there is,” Tom says emphatically. Tom is a retired long-haul trucker and claims to have a trucker’s natural antipathy to anything bicycle related. And he doesn’t mind being loud about it. But it is Tom’s place where Shane and Crystal have parked their motorhome. They’ve fled a “bad situation in Moscow” only to find a worse one in Clarkston. They’ll be back in Moscow Friday, Crystal says. Tom’s bark seems worse than his bite. Crystal: If Shane doesn’t pedal that trike a certain amount of time everyday, he just can’t function. “When I command that lane dead center, the traffic blends to the other lane seamlessly. Shane’s talking about the Blue Bridge between Lewiston and Clarkston. He’s been hauling scrap metal across the bridge and Memorial Bridge to Pacific Steel in North Lewiston. This is his current livelihood. 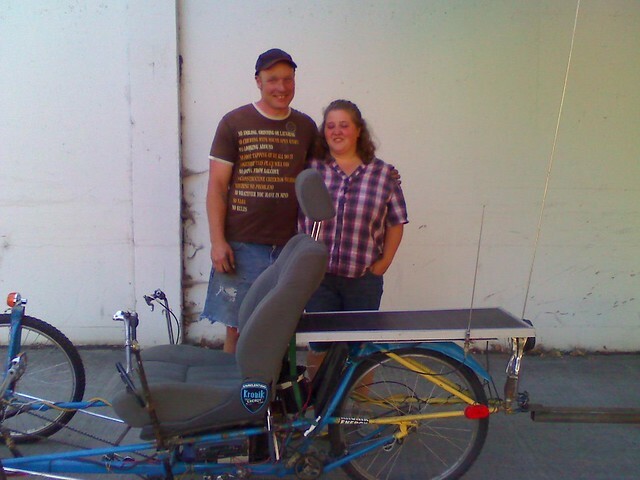 “I wouldn’t have this job if it weren’t for this trike.” Shane and Crystal have returned to Moscow where he’ll have a job collecting scrap and hauling it back to his employer. “Someone who works hard enough to haul scrap with a trike, must be a good worker,” he explains his good fortune. And after an hour and a half of listening, I believe him.